"Current usage of the terms conceptual framework and theoretical framework are vague and imprecise. In this paper I define conceptual framework as a network, or 'a plane,' of interlinked concepts that together provide a comprehensive understanding of a phenomenon or phenomena. The concepts that constitute a conceptual framework support one another, articulate their respective phenomena, and establish a framework–specific philosophy. Conceptual frameworks possess ontological, epistemological, and methodological assumptions, and each concept within a conceptual framework plays an ontological or epistemological role. The ontological assumptions relate to knowledge of the 'way things are,' 'the nature of reality,' 'real' existence, and 'real' action (Guba & Lincoln, 1994). The epistemological assumptions relate to 'how things really are' and 'how things really work' in an assumed reality (p. 108). The methodological assumptions relate to the process of building the conceptual framework and assessing what it can tell us about the 'real' world." Jabareen, Y. (2009). Building a Conceptual Framework: Philosophy, Definitions, and Procedure. International Journal of Qualitative Methods, 8(4). "Uncertainty may be an important component of the motivation provided by learning games, especially when associated with gaming rather than learning. Three studies are reported that explore the influence of gaming uncertainty on engagement with computer– based learning games. In the first study, children (10–11 years) played a simple maths quiz. Participants chose their preferred reward for a correct answer prior to seeing each question. They could either receive a single point or toss an animated coin to receive 2 points for heads or none for tails. A preference for the uncertain option was revealed and this increased during the quiz. The second study explored the discourse around learning when pairs of participants (13–14 years) competed against the computer in a science quiz. Progress depended on the acquisition of facts but also on the outcomes of throwing dice. Discourse was characterised by a close intermingling of learning and gaming talk without salient problematic constructions regarding fairness when losing points due to gaming uncertainty. A final experiment explored whether, in this type of game, the uncertainty provided by the gaming component could influence players' affective response to the learning component. Electrodermal activity (EDA) of 16 adults was measured while they played the quiz with and without the element of chance provided by the dice. Results showed EDA when answering questions was increased by inclusion of gaming uncertainty. Findings are discussed in terms of the potential benefits of combining gaming uncertainty with learning and directions for further research in this area are outlined." 1). Howard–Jones, P. A. and S. Demetriou (2009). 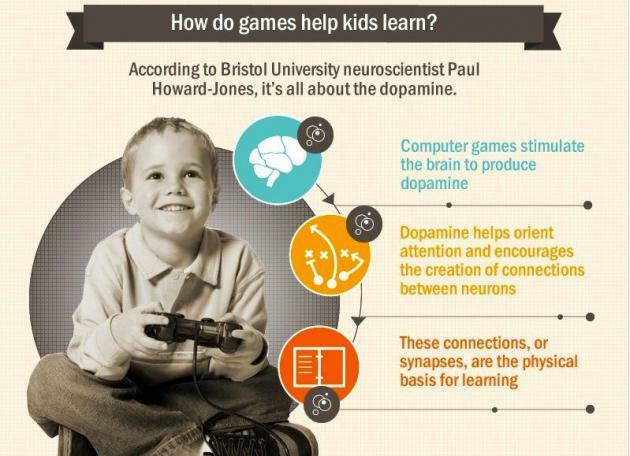 "Uncertainty and Engagement with Learning Games." Instructional Science: An International Journal of the Learning Sciences 37(6): 519–536. 2). Paul Howard–Jones, 2014, radio programme, BBC Radio 4 – The Educators, episode 5 of 8, first broadcast: 10 September 2014. "This narrated computer animation shows results from a research project involving simulated Darwinian evolutions of virtual block creatures. A population of several hundred creatures is created within a supercomputer, and each creature is tested for their ability to perform a given task, such the ability to swim in a simulated water environment. The successful survive, and their virtual genes containing coded instructions for their growth, are copied, combined, and mutated to make offspring for a new population. The new creatures are again tested, and some may be improvements on their parents. As this cycle of variation and selection continues, creatures with more and more successful behaviors can emerge. 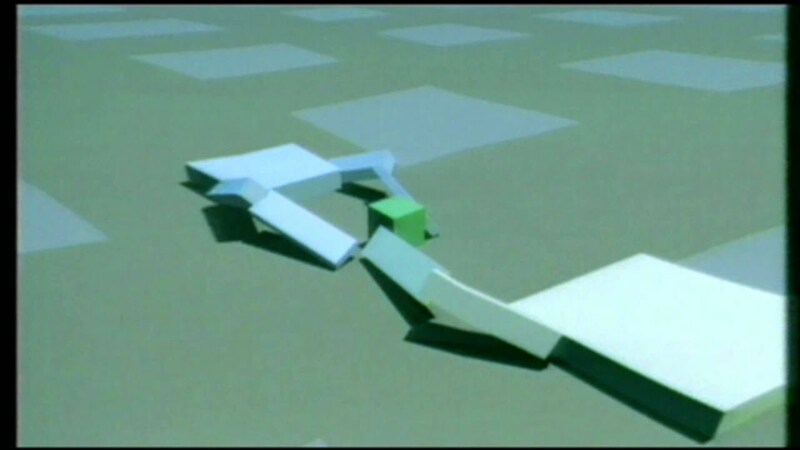 The creatures shown are results the final products from many independent simulations in which they were selected for swimming, walking, jumping, following, and competing for control of a green cube." "So, working with Bentley and MicroStation, we've written a custom piece of software that networks all of the components together into these chunks of information, so that if we change any element along the length of the building, not only does that change distribute through each one of the trusses, but each one of the trusses then distributes that information down the length of the entire facade of the building. So it's a single calculation for every single component of the building that we're adding onto. So, it's tens of millions of calculations just to design one connection between a piece of structural steel and another piece of structural steel. But what it gives us is a harmonic and synthesized relationship of all these components, one to another. This idea has, kind of, brought me into doing some product design, and it's because design firms that have connections to architects, like, I'm working with Vitra, which is a furniture company, and Alessi, which is a houseware company. They saw this actually solving a problem: this ability to differentiate components but keep them synthetic. So, not to pick on BMW, or to celebrate them, but take BMW as an example. They have to, in 2005, have a distinct identity for all their models of cars. So, the 300 series, or whatever their newest car is, the 100 series that's coming out, has to look like the 700 series, at the other end of their product line, so they need a distinct, coherent identity, which is BMW. At the same time, there's a person paying 30,000 dollars for a 300–series car, and a person paying 70,000 dollars for a 700 series, and that person paying more than double doesn't want their car to look too much like the bottom–of–the–market car. So they have to also discriminate between these products. So, as manufacturing starts to allow more design options, this problem gets exacerbated, of the whole and the parts."